Last Fall I started my first 15mm metal army to play the wargame, De Bellis Antiquitatis. I ordered a bunch of Dacian figures from Essex Miniatures. To add variety in the poses I also bought some of their Celts. The Celtic and Dacian warriors were equipped similar enough for these models to mix well. The shipment from England took forever, so I started building my camp element, a Dacian farmstead. I started work on November 16, 2007. I choose a camp base size of 70 x 100mm. The rules offer alot of leeway with camp sizes, so I looked around the web to find a common size. The base itself is sheet styrene from Evergreen Models. This is cool stuff. You can score the sheet with a blade and snap off a piece. The walls are made of balsa wood. I made the mistake of setting the grain of one of these walls vertical (perpendicular to the length of the wall). This caused the piece to warp, but with the roof on it is not too noticeable. Always cut wood with the grain! 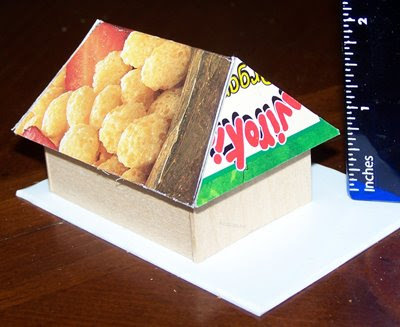 The roof is cardboard from a box of gluten-free cereal! Coming up with thatch for the roof was an interesting problem. If I were making a 28mm scale building I would use fake fur. This scale is way too small for that, so I went with putty. I squished the green stuff down on the the roof and etched it with a sculpting tool. I think it looks pretty convincing! 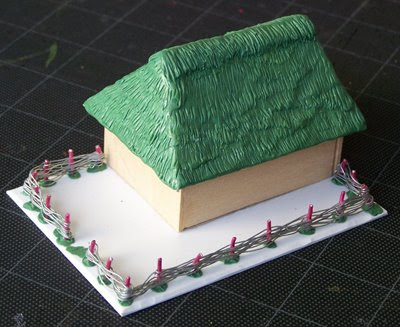 The wattle fence posts consist of a pink paperclip clipped into short lengths. The wattles are thin wire, woven around the uprights. I brushed PVA glue (Elmers Glue) over the wire to prevent it from popping out of place. I wanted to add some 15mm scale animals to complete the farm look. I had already ordered my Dacians from Essex, which doesn't have a very good animal selection. All the animal sets I could find are from English companies. Ordering a single pack from the UK is a problem because of the high shipping charge. With the low dollar, and international shipping this would have cost me almost $20 - just so I could use 2 goats and a cow. Luckily, a friend told me about a local manufacturer. MiniFigs is a pretty well known range sold by Game Figures, Inc. - right here in Colorado, USA. I have return to this project sporadically. I'll post new photos as I progress.